"London. A snowy December, 1888. Sherlock Holmes, 34, is languishing and back on cocaine after a disastrous Ripper investigation. Watson can neither comfort nor rouse his friend – until a strangely encoded letter arrives from Paris. In this Sherlock adventure, we are on the hunt again as John Watson, in true Arthur Conan Doyle style, gives us an account of the newest and most harrowing case. I wanted to read this because I absolutely love mysteries and what’s a better way to sate my appetite than a Sherlock tale? This story did not disappoint, as it had a wonderfully thrilling pace, while remaining true to it’s time in history. I loved how the authenticity of the novel was replicated from Doyle and used to influence the author’s writing style. Not only was it the writing style that made it feel like an original tale, but also the different mannerisms displayed that characterized the original Sherlock and Watson. With Holmes’ vulnerability to drugs, his feigned disinterest in women, and knack for disguises, I felt Art in the Blood effectively used provenance to familiarize it’s audience with the classics. The only thing that I found upsetting in the novel was the subject matter involving the children. It felt like déjà vu, from when I read a couple previous Sherlock tales by other authors with the exact same situation (which made me not want to finish those books,) and I was wondering why so many authors feel the need to rehash this same tale. I’m glad to say that the subject wasn’t as pronounced as in the other stories I’ve read, and it was just limited to bare essentials needed to pair with the mystery. In all, I found this book fascinating both from it’s mystery and it’s delivery. There were bits of humor, sarcasm, and even little hiccups along the way to lead it’s reader’s through it’s thrilling chapters. 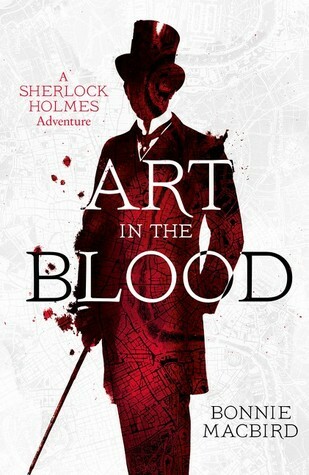 I would more than recommend this book to any original Sherlock Holmes fan, and I’m definitely looking forward towards reading more from this author.